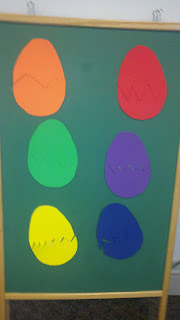 Story Time With the Library Lady: Flannel Friday--Well, "Foam Friday" Really--"Eggcellent"
Flannel Friday--Well, "Foam Friday" Really--"Eggcellent"
My daughter needed an emergency visit to the orthodontist the same day I had 2 preschool classes visiting back to back in the AM. I needed to leave early, so I called the director of preschool #2 and asked if the class could come earlier in combination with the class from preschool #1. Being a long time patron herself and generally nice person, she was fine with it. I then had one hour to readjust the planned program. The books I had, with the theme of eggs weren't going to work--too small for a large group. 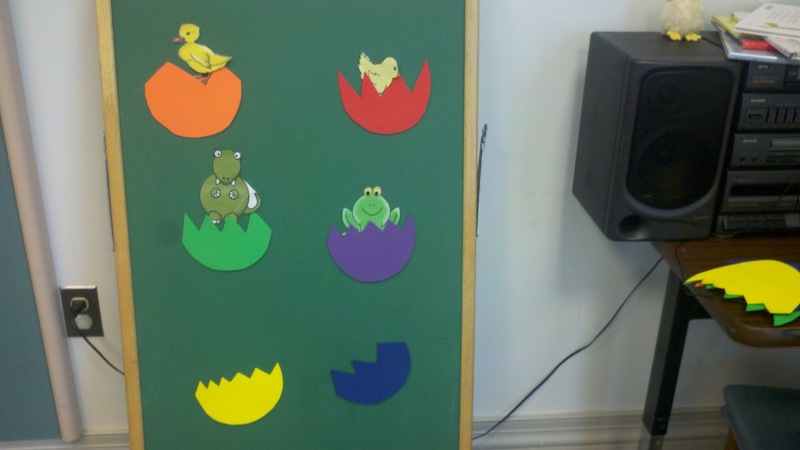 So I moved over to a "spring things/eggs" sort of them, trotting out my brand new "big book" edition of The Very Hungry Caterpillar, and pulling out the puppets for "Who's In Rabbit's House? ", which is also caterpillar related. And since caterpillars come from eggs, I could still use my egg shakers and do Laurie Berkner's fabulous, bluesy "I Know A Chicken". 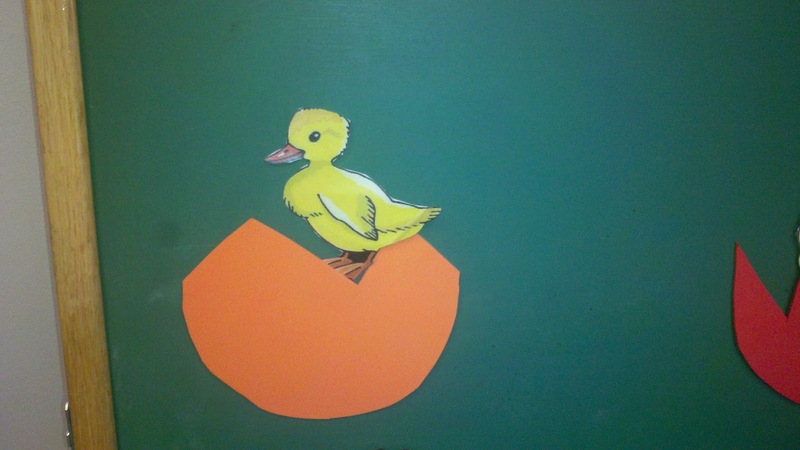 I'd also made a flannel board, inspired by Miss Mary Liberry's "Baby Duck" flannel board. The two and up crowds had loved it, but it was too small for this big group. So I hunted through my craft files, found a large cardboard egg outline, grabbed some sheets of fun foam and made larger eggs. Fun foam is one of my favorite craft materials to work with--it's soft and pliable, but had more substance than felt. Easy for me to cut, even with my awful left-handed cutting! I had made the original animals from clip art found in various places--can't remember the source, and then I'd pasted all four onto one page on Print Shop. All I had to do was enlarge them. Some of you <sigh> may be too young to know this program, but I have a 10 year old version that works beautifully and I use a lot for graphics. Magnets on the back of the foam pieces. Contact paper over the paper animals and magnets on their backs too and I was set. And a good thing too. Because not only did my 2 classes show up, a third class from another school walked in! The first 2 schools serve the well to do and I have regular contact with them. The third school serves mostly underprivileged kids and I have had very sporadic communication with them. It's the sort of place where the teachers change frequently. But the current teachers have been calling me regularly for books. They didn't know I do preschools separately from the public programs due to space problems. They had just walked in and how could I have turned them away? I didn't. So I had about 50 kids for one very, very, cool program. They LOVED the egg game. I didn't say a rhyme, I just said something to the tune of "Can you help me find the baby duckling?" With so many kids, I just closed my eyes, wiggled my hand a lot and then pointed at someone to take a turn. Somehow <grin> I managed to get someone from a different class each time. I asked them to count backwards together from 10 to 0 as they shook the eggs. Occupied their hands and gave me a chance to get things done. It was an (sorry) EGGCELLENT event!